Mission Santa Cruz. Courtesy of Santa Barbara Mission Archive-Library. Mission Santa Cruz, dedicated twelfth in the mission chain on August 28, 1791 by Farther Lasuén, is a tiny mission along the northern California coast. Unlike the rest of California’s missions, leaders did not name Santa Cruz after a saint, rather after the holy cross. Although small in size, Mission Santa Cruz experienced a large string of misfortunes. First, a pueblo named Branciforte, was established on the other side of the river. Branciforte was founded with former prison convicts from Guadalajara. These settlers took land away from the Indians and used mission property at will. Then, in 1818, the evil pirate Hippolyte de Bouchard was seen approaching the mission. De Bouchard had earlier vandalized Monterey, and for fear of a reoccurrence at Santa Cruz, the mission residence packed up valuables and fled to Mission Soledad. Unfortunately, some of the people from Branciforte took advantage of this mission vacancy and looted many of the remaining items left behind at Santa Cruz. 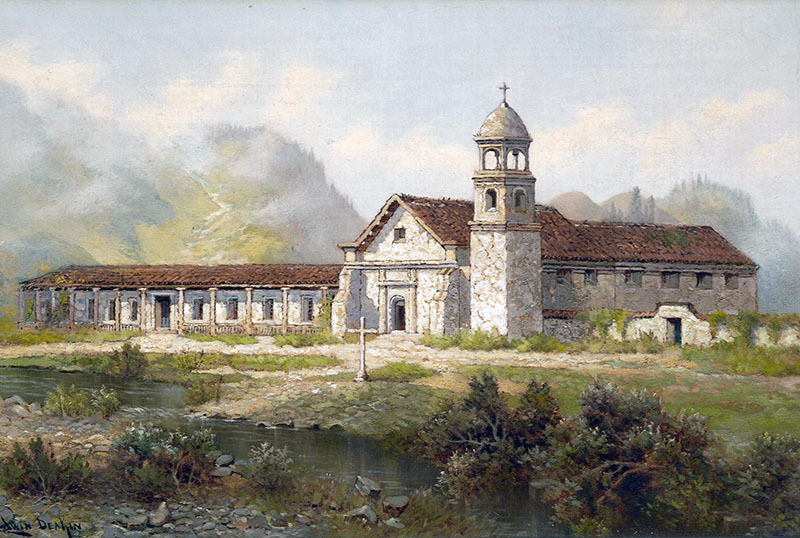 Secularization followed in 1834, depleting resources and causing the mission buildings to fall into disrepair. An 1845 earthquake toppled the church’s bell tower. Later, the earthquake of 1857 collapsed the mission buildings. Completed in 1931, the current chapel is one-third the size of the original. The previous bell tower contained nine or ten bells, while today the replica contains only one. Inside the mission original paintings, statues and even a challis used by Father Serra, remain intact. The mission museum features vestments from significant periods in California history. From CA-17 South: Exit CA-1 toward Half Moon Bay. Merge onto CA-1 north. Turn left onto Mission Street. Turn left onto Emmett Street. The mission sits on the corner of Emmett and High Street. Please call the Santa Cruz Mission State Historic Park at 831-425-5849 for information. The Mision Galeria is a gallery of historic relics and contemporary religious art. The Galeria is open Tuesday-Saturday 10a - 4p and Sundays 10a - 2p, closed Mondays except after major holiday weekends. Please call 831-426-5686 for further information.